Candidates other than Kapu, Balija, Gajula Balija, Telaga and Ontari candidates are not eligible for the Job Mela. Candidate should bring (caste) Certificate invariably. Students from Reddy community of Nellore, Chittoor, Kadapa, Anantapuram, and Kurnool districts with Kapu caste certificate issued by the Tahsildhar are not eligible. Students of Turupu kapu & Gajula Kapu community are not eligible. Caste certificates issued by All India Telaga Kapu Balija Sangham are invalid. Candidates should be in the age group of 18 to 30 years. Candidates are required to bring copies of academic records/mark sheets, 5-7 copies of resume, photos and a copy of Aadhar Card. Every half an hour, free buses will be arranged from Ibrahimpatnam junction to the venue. 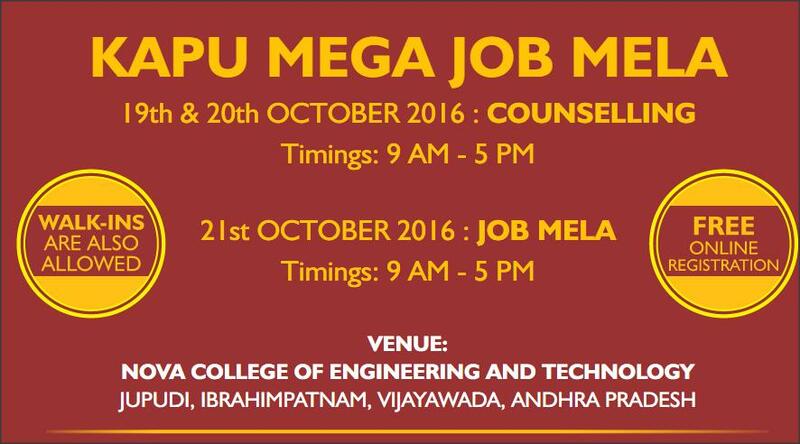 Students can attend the counselling on 19th or 20th October, 2016. Candidates who have attended to counselling on 19th or 20th can go back and attend Job Mela on 21st. Dormitory accommodation will be given in the college for long distance candidates. Job Mela will commence from 8.00 AM onwards on 21st October, 2016.